Christopher Marlowe’s Doctor Faustus was one of the most frequently performed plays of its time. Though its popularity may have waned over the centuries, its pertinence surely has not. 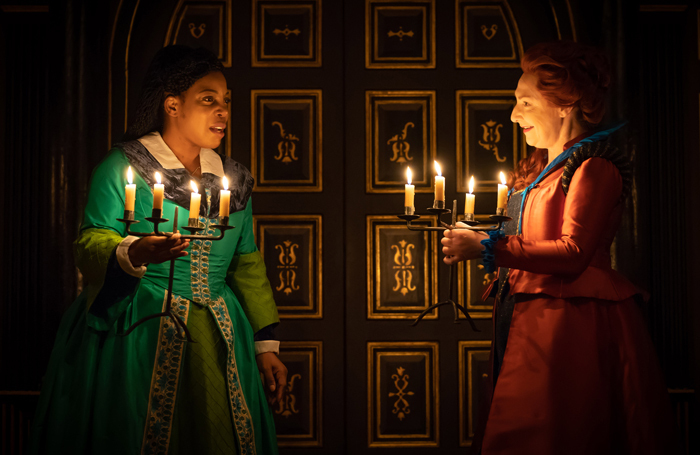 It’s a change to see director Paulette Randall take charge of a classical text, and satisfying to see the result staged in the candlelit Sam Wanamaker Playhouse. In Randall’s production, both Doctor Faustus and Mephistopheles are cast as women. Jocelyn Jee Esien – loved for her noughties BBC comedy Little Miss Jocelyn – shows off her range in an elegant portrayal of the title role, while Pauline McLynn (who famously played Mrs Doyle in Father Ted) is well matched as Mephistopheles, her devil underling. The choice to subvert the gender of the two leading characters challenges conventional notions of status and power, catapulting the 16th-century narrative into a 21st-century sphere. Eminent scholar Doctor Faustus is dissatisfied with conventional forms of knowledge and decides to take up magic. For her first trick, she conjures up Mephistopheles, with whom she makes a contract to sell her soul to the head devil Lucifer. She does this in exchange for 24 years of unquestioning service. The plot draws parallels with our social media-obsessed society. During her years with Mephistopheles, Doctor Faustus travels the world and earns fame for her skill. In Rome, she indulges in some invisible shenanigans at the Pope’s expense. This is a real crowd-pleaser of a scene in which Sarah Amankwah shines. Under the musical direction of Phil Hopkins, Joseph Roberts’ compositions are incredibly evocative. The chiming bells and thunder claps of the sound design are so seamless that even though the musicians and their array of instruments large and small are in plain sight for the duration of the performance, you barely notice them at work. While the dialogue remains true to Marlowe’s original text, Randall directs with contemporary flair. There’s an Afrocentric energy to Lucifer’s presentation of the Seven Deadly Sins, who perform a ritualistic dance with gazelle-like grace in the cabalistic golden circle of Libby Watson’s design. It is clear that there is some intention to experiment with the boundaries of classical theatre here but the production sometimes struggles against the limitations of the space.